NEW CASTLE, Pa. — The New Castle High School gym was rumbling the entire game. The gym was packed with fans ready to see two of the top five teams in the state battle it out in the state playoff semifinals. This game meant a lot for the Tigers after losing in the WPIAL championship game after being up by double-digits at the beginning of the second half. Moon needed to redeem themselves and move onto the state finals to cement their place in the history books. 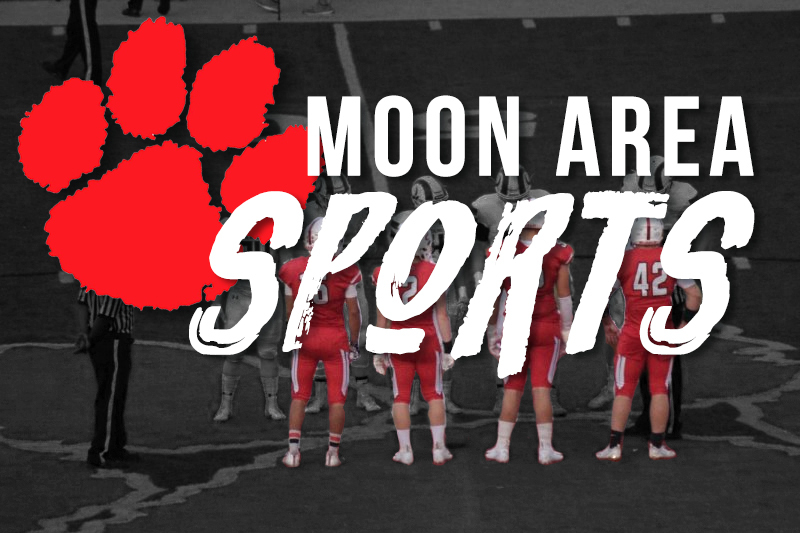 Moon dominated in every aspect of the game and built upon their lead in every quarter. The first quarter started eerily similar to the championship loss the Tigers suffered a few weeks ago. Moon scored off two consecutive possessions to take a quick lead in the beginning minutes. Mars responded with a couple of scores of their own to tie the game back up. The crowd was fired up even at the start of the game. The Moon student section shouted their usual Carmody taunts as Mars used their championship win as fuel for their chants. Moon would have plenty to cheer about as they closed the quarter on a short offensive burst. They would end the quarter on a buzzer beater layup from Connor Ryan to cap off a 7-2 run in the final minutes of the first quarter. Moon ended the quarter on top 15-10. “You can’t guard him.” This chant filled the gym as Donovan Johnson put on a scoring clinic in the second quarter. Johnson would have 14 points in the quarter alone and ended up scoring 28. The quarter started out with four consecutive three pointers, two from Moon and two from Mars. The Tigers began to get a little fancy on the floor as they got comfortable with their lead. Jioni Smith gave a no look pass to a streaking Johnson for an easy layup. Later on in the quarter, Johnson tried a three near half court. Throughout this quarter it was evident to the crowd that Moon was comfortable with their lead and they were playing for an impressive win. Moon came out of the first half on top 35-24. Moon was determined to not let what happened in the WPIAL championship game happen again in the state semifinals. In the WPIAL championship game, Mars ignited an impressive comeback to eventually steal the title away from Moon. The Tigers, knowing what happened last time, came out firing. They sunk the first three shots they made to increase their lead even further. The Tigers did not stop playing with intensity. Throughout the quarter they racked up a few steals and a couple of blocks on the defensive end. This third quarter looked nothing like that uneventful third quarter a few weeks ago. Moon entered the fourth quarter with a 55-39 lead. In the fourth quarter, the Tigers were looking to put away the Fighting Planets. Moon hit a few key shots and got into the bonus very early. A total of six trips to the foul line for Moon helped build upon their lead. Mars could not overcome Moon’s fantastic play and would go on to lose 73-55. Moon will play Archbishop Wood this Friday in Hershey at the Giant Center for the state title. Archbishop Wood is coming off an impressive win of their own against Abington Heights that went into overtime. In order for another state title to be brought back to Moon, the Tigers must play just as they did against Mars.